Denne rene ejendom med 2 soveværelser fuldt renoveret i 2019 ligger på strandpromenaden med hav og bjergudsigt. Dette har en sydvendt altan med sol fra tidlig morgen til solnedgang. Tæt på barer / restauranter, og det er kun 5 minutters gang til den berømte Fish Alley. Det har alt køkken væsentlige / sengelinned, håndklæder mv. WIFI installeret og tv med over 100 internationale stationer, herunder engelsk, irsk, spansk, dansk, svensk, norsk, tysk, fransk og nederlandsk. 10 minutters gang til tog / busstationer gør det derfor bekvemt for adgang til lokale faciliteter eller tog til lufthavnen. Rengøring / håndklæder / linned / stuepige service: Alle linned og håndklæder leveres. Emplacement extra superbe vue sur la mer et la montagne parking gratuit sur place que demander de plus? Positive – the location on the top floor with a few minutes walk to the city center, a few minutes to a large supermarket and a few seconds to the beach, restaurants and small shops. Well equipped with plenty of linen, towels and kitchen things, modern TV and wifi, and washing machine. The best view ever from a shower! We arrived late in the evening but that was no problem, smooth arrival and departure. Negative – not so much, but the floor was dirty and some of the furniture could need some attention. And how did the architect think when the door opens INTO the very small bathroom? Overall, satisfied with the vacation, the apartment and the town. And the day trips by car to Gibraltar, El Caminito del Rey and to Alhambra. Great beachside location but photos on website alarmingly misleading. Apartment small, tired and poorly furnished with exception of relatively new t.v. Would not be suitable because of size for more than two people despite stating it accommodates 4/5. Kitchen so tiny only one person can access, likewise shower room door access is restricted because door hits toilet. Most concerning railing on side elevation of balcony is detached from fabric of building. Extremely dangerous on 12th floor balcony. 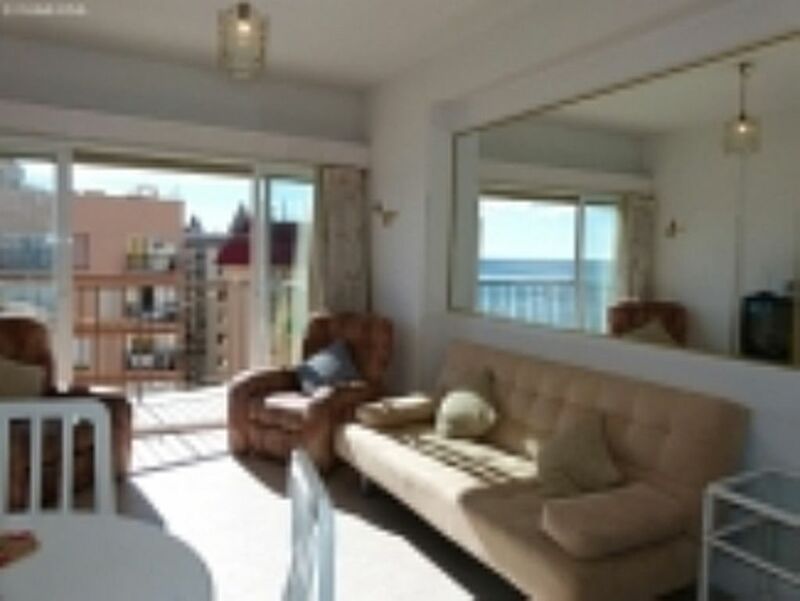 Hi Alex thanks for the review on the beach front apartment and location The photos are what they are. The fact that you couldn't see the wifi code and kept ringing me for 2 days and I was very helpful then you bought a magnifying glass and said it was okay The pictures don't lie I've also got the maintenance man to have a check out the balcony I've never had any issues before. Four of us had a great week's stay in Robbie's lovely apartment in Fuengirola. The pictures of the apartment do not do it full justice as it is really spacious and has a wonderful view from the balcony. It was spotlessly clean, comfortable and excellent value for money. It was quiet at night and was an ideal location across the road from the beach. Robbie was easy to deal with and we had a really enjoyable stay at Robbie's apartment. 10 meter til nærmeste strand. 5 minutters gang til Zoo. 10 minutters gang til Badeanstalt. 10 minutters gang til bus / togstationer. Malaga lufthavn ligger 20 minutters kørsel væk. Malaga lufthavn er en 30 minutters togrejse væk med en togstation ligger tæt på terminalbygningen. Booking Notes: Prices are for the property per week in UK Pounds. For specific dates please contact owner. 30% deposit 6 weeks prior to travel with balance due on arrival. Notes on prices: Prices qouted in pounds sterling maybe changed to euro by arrangement of exchange rate at time.